This year’s partial solar eclipse, visible over mainland Britain, provided a great opportunity for HAB enthusiasts to photograph the phenomena. Near Space photography found that the results from action cameras like the Go Pro Hero were relatively disappointing due to dazzle, sun motion during exposure, misting, and poor zoom. Last Friday morning mainland Britain witnessed a partial solar eclipse, reaching a maximum at 9:30a.m. Even though conditions were relatively clear at the launch site in Welshpool, Near Space photography used the opportunity to see if HAB could provide better images of the eclipse. 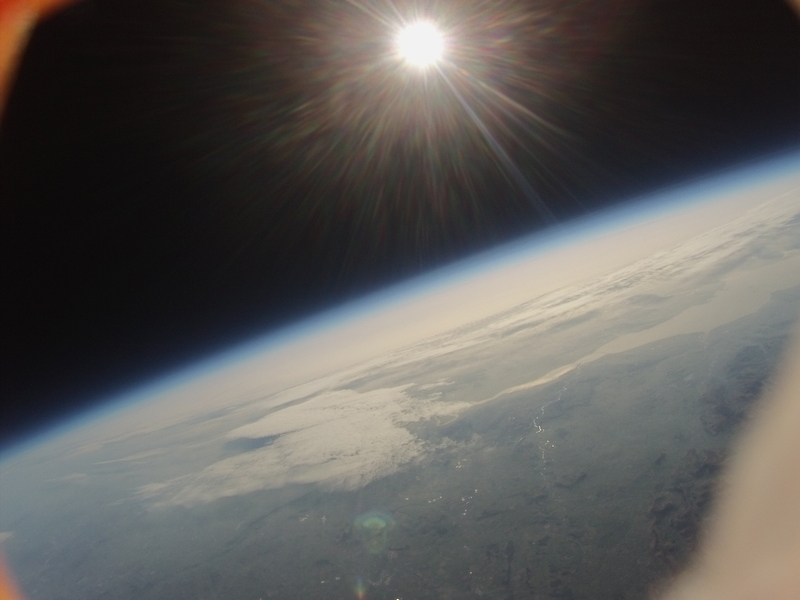 A light northerly wind provided ideal conditions to fly a balloon 800gm balloon and 1600gm camera payload. The NSP payload used 4 Go Pro Hero cameras including the 4 Black, 3+ Black, and 3 White models to acquire both video and stills of the eclipse. The Go Pro Hero 4 Black was set to video capture mode and was set to 1080 mode with a capture rate of 50 fps. No solar filter was used. The sun, even though experiencing a 90-95 % eclipse still provided enough illumination to completely dazzle the sensor. The eclipse was not observable. A dense solar filter, such as those used on solar viewing glasses, provided more satisfactory results. This time the camera used was the Go Pro Hero 3+ Black recording stills every 5 seconds. Solar glasses reduce the intensity of the sun’s light to such an extent that only the sun is visible. 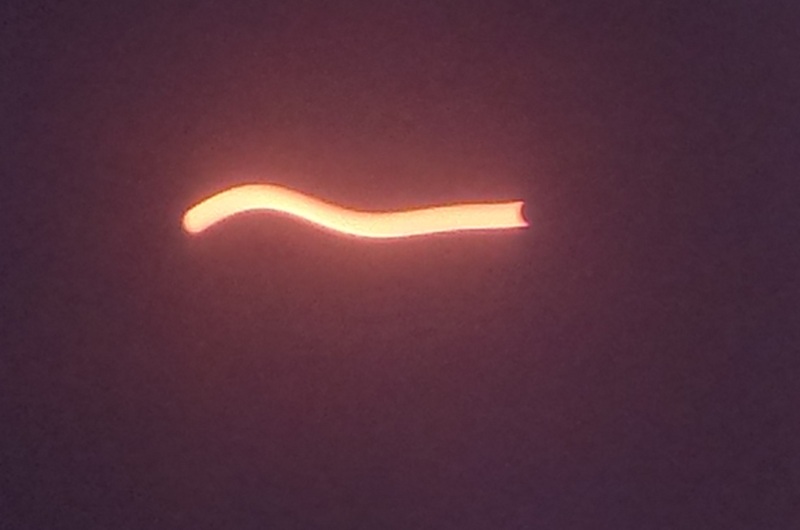 The outline of the sun and the eclipse was clearly visible on the images recorded. Due to the strength of the filter, the camera extended the image exposure time. 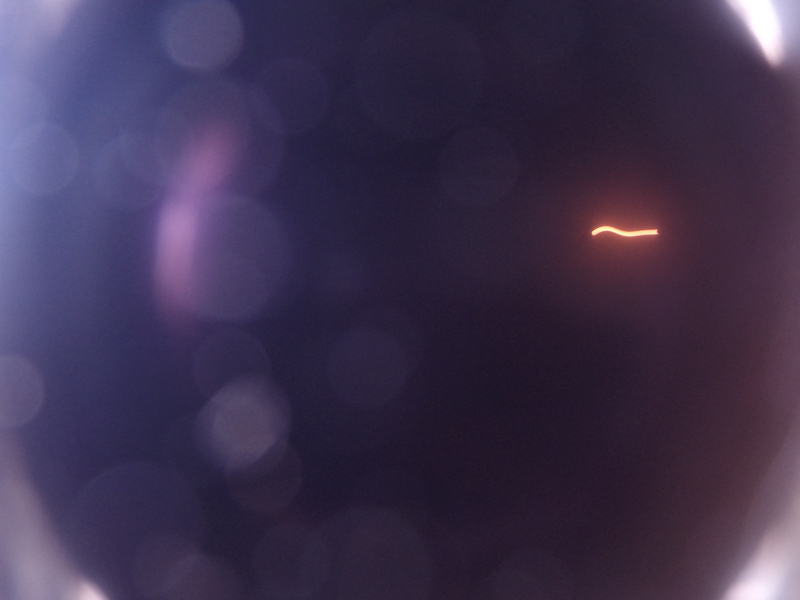 The movement of the payload during the exposure time caused the ‘streak’ of the sun on the image. Of over 1000 stills collected, only 4 showed a the sun without streaking. These were taken early on in the eclipse. The image highlights a second problem, that is the level of zoom in the Go Pro Hero camera. Solar photographers recommend at least a 12 times optical zoom in compact cameras for taking images of the sun. The images also shows some fogging on the inside surface of the solar filter which could obscure the image of the sun.